Henry was born on 3 AUG 1841 in Arkansas, the son of unknown parents. 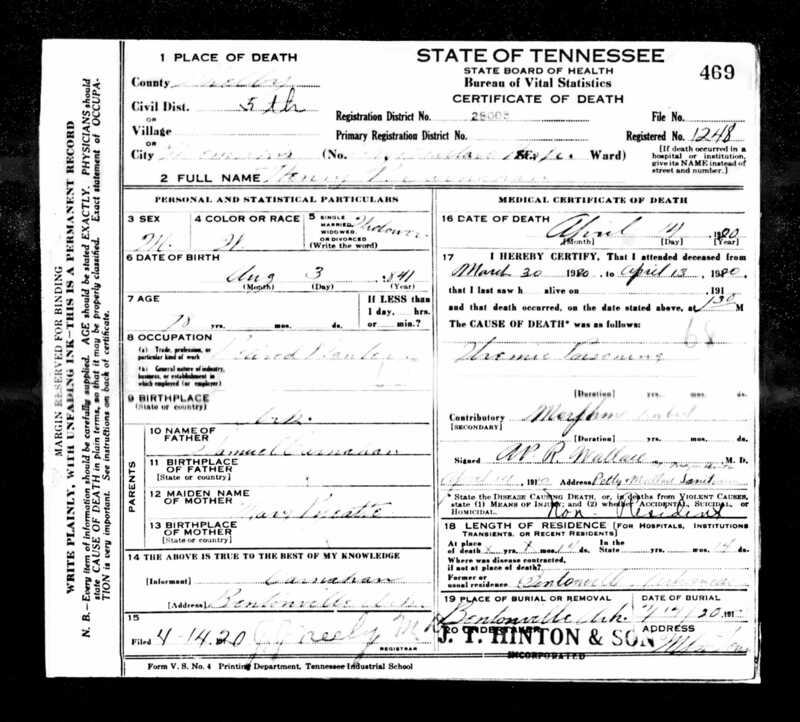 He died on 14 APR 1920 in Memphis, Shelby County, Tennessee. He had two marriages/partners. His first wife was Melissa Ann Lefevre, who he married in ABT 1865. The place has not been found. Their only known child was Samuel Lefavre (1868-1929). His second wife was Sarah M. Woods, who he married on 6 OCT 1890 in Benton County, Arkansas. They had no known children. CARNAHAN, Mrs. Henry P. - Mrs. Henry P. Carnahan died last Saturday at Bentonville at the age of 58 years. She had lived in Benton county all her life and had many friends in and around Rogers. She was an aunt of Misses Lillie and Annie Woods of this city. Sam and Will Carnahan, sons of H.H. Carnahan, also Mrs. Harry Patton, daughter of H.P. Carnahan, is here. The children of Mr. Carnahan are here in love and duty to be near Mrs. Carnahan, who is very ill, and we are sorry to report that there is no improvement in her case. CARNAHAN, Sallie M. WOODS - The close of the week and the close of the day marked the close of a life well spent, and quietly and calmly the light of a beautiful life went out when Mrs. Sallie M. Woods Carnahan, wife of H.P. Carnahan of this city, closed her eyes in the last long sleep and peacefully passed through the pearly portals to her reward. No words of mine, though a close personal friend of nearly fifty years, could portray the virtues of this truly noble woman. I have known her in every relation of life and have found her always to be a character who had the courage of her convictions and loyal by every instinct of her nature, first to her church, then to her family and friends. Through the long weary months that she has suffered with an incurable malady, her patience and resignation have been wonderful and sublime. She was the youngest of four sisters, none of whom were physically able to give her the comfort of their presence during her last hours, but the untiring and unceasing ministrations from a large family of relatives testifies the depth of their unspeakable grief and irreparable loss. The faithful and devoted husband, whose desolate home and life can never again by the same, spared no effort, left nothing undone to gratify her every wish, to stay the hand of fate and hold yet a while longer the life so dear to all. The comfort and presence of a loving and dutiful daughter, who relinquished the duties of her distant home and came with tender sympathy and solicitude to give solace in their hour of need, was gratifying to both through the last dark hour. A happy home has been made desolate and where once the sunbeams played, now the shadows fall. M.A. CARNAHAN, Henry P. - Henry P. Carnahan, brother of Rev. Peter Carnahan, passed away at his home in Southern Arkansas. He had lived in Bentonville for a number of years before going south and is well known here. Henry P. Carnahan, a brother of Rev. Peter Carnahan of Bentonville and the father of Mrs. Harry Patton of Clovis, New Mexico, died last week in a Memphis hospital. He was past 70 years of age and had lived in Bentonville for more than 30 years. The body will be taken there for burial.